Every morning, I glance outside, stretch, then reach for my iPhone. Checking the time, I quickly scroll through a few quick things online, then begin my day. But every evening, I always wish I had my laptop nearby. But with nothing to put it on, I’ve never bothered… until now! 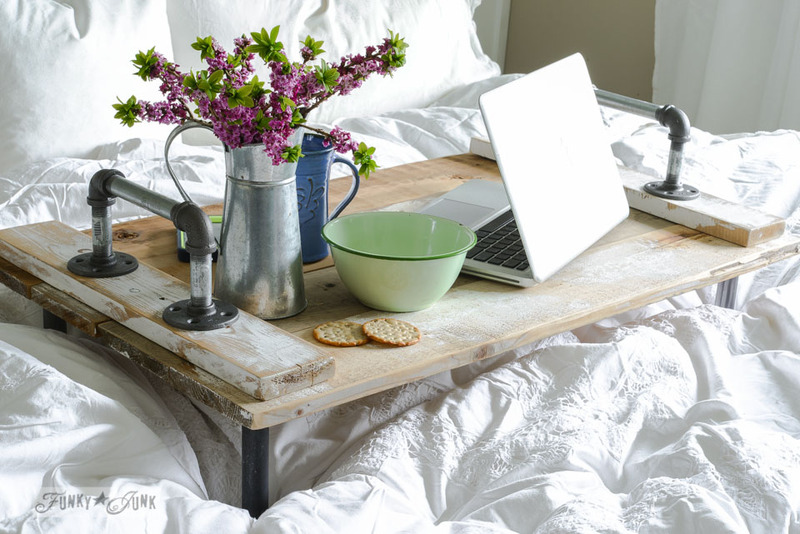 Springing up the bedroom with a pipe handled bed tray was the finishing touch my room needed. For MANY different reasons! 1) Decide the size of your tray based on how you desire to use it. I placed my laptop on top of the wood to get an idea on the size of my own. My finished tray size ended up being 36″ x 16. 3) Screw the boards together. I flipped the works upside down and attached screws from the bottom so they didn’t show when uprighted again. Just make sure the screws aren’t too long to protrude through the support boards! 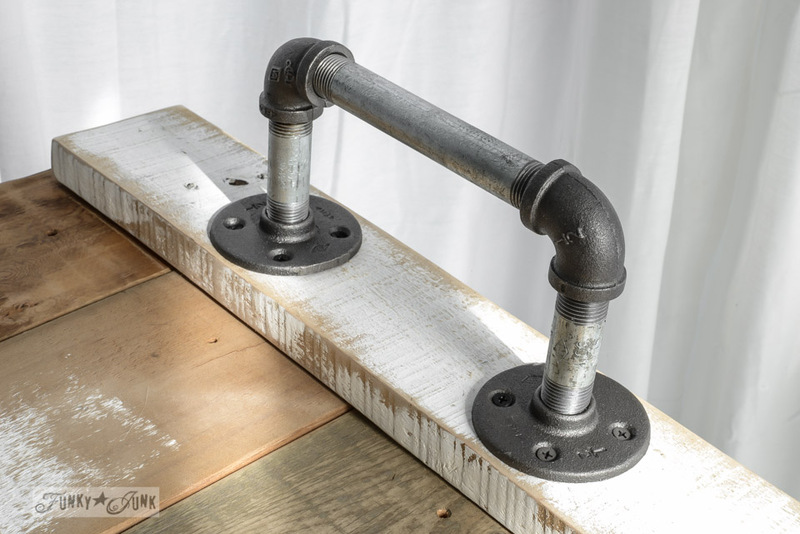 4) Select pipe fittings to create 4 legs and 2 handles. This was a little like playing blocks. You mix and match the sizes and pieces you need. And to shake things up, I chose a mix of black and galvanized finishes. The handles were ½” fittings and the legs, ¾”. I believe the legs are 6″ long. They were the perfect height! 5. 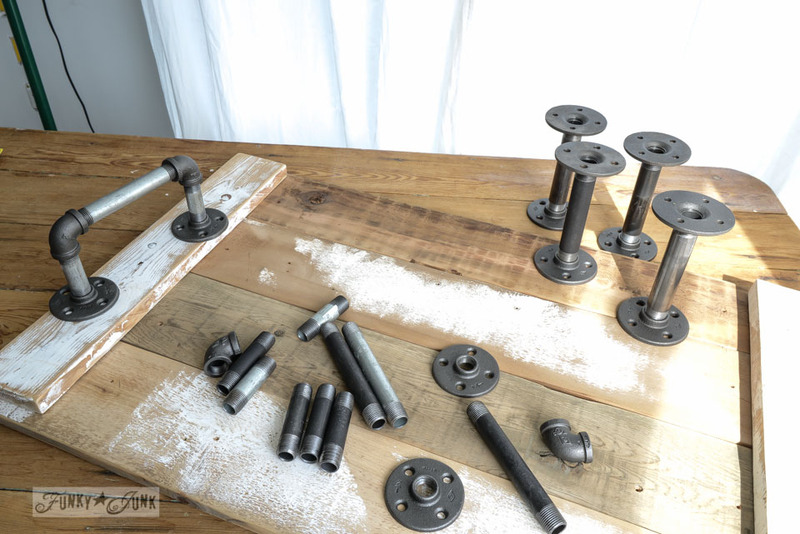 With pipes already assembled together, attach them through the flanges to the boards as shown above. The tray was first flipped upside down, as I attached the legs on all four corners. Then the tray was uprighted, attaching the two handles to the support planks. So simple! The pipes really do all the work for you! 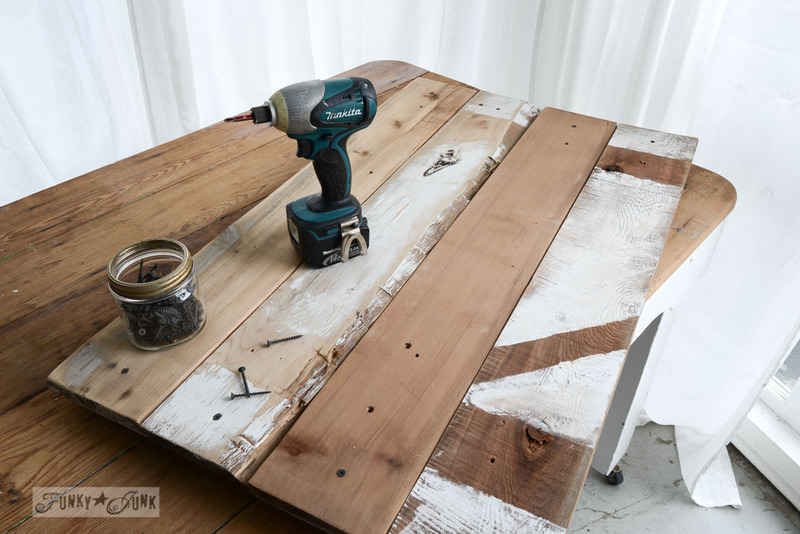 If your reclaimed wood is fairly old, you may find pre-drilling holes helpful to avoid splitting the wood as you attach the pipes. The bed received a new light fluffing too. 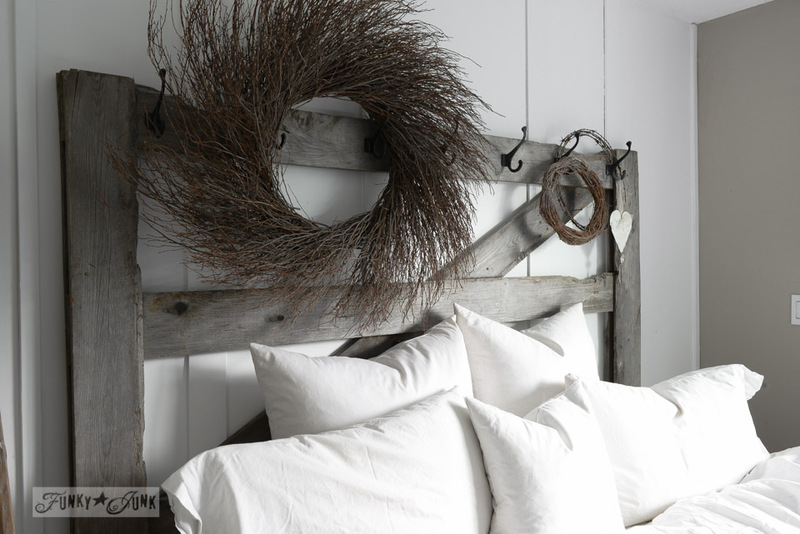 With all white pillows and quilt (I already had), the crisp laundry off the line look was ready to chime in spring! 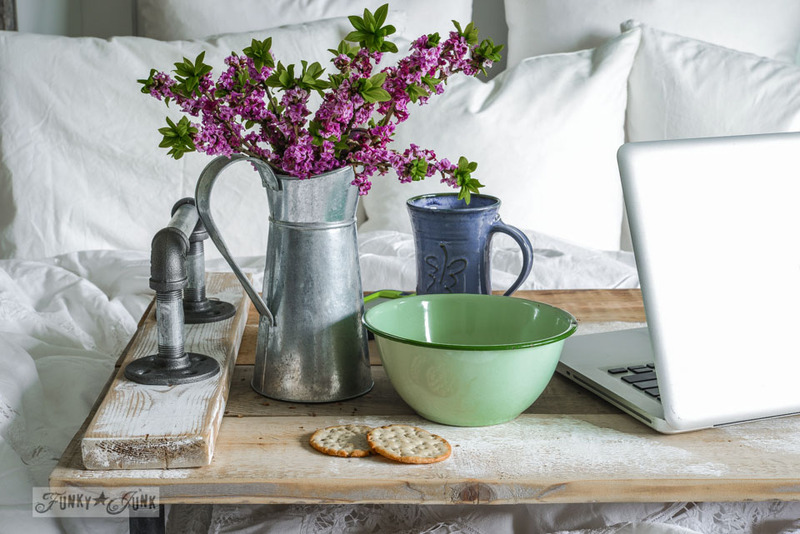 A touch of colour with bright spring blooms and a pretty mug was the perfect finishing touch. It wasn’t that long ago that I had the sniffles and went to bed for a midday nap. I was so wishing for something to put a nice mug of soup on, or the lap top. And the odd evening my son hogs gets the TV, it would be so nice to watch Netflix from the comforts of my covers. I am just beyond thrilled this tray has finally happened! Just note, there is weight to this tray from all the pipes. But that makes it nice and sturdy, which I love. I actually had no idea there were so many flavours! I’m on the lookout for the sugar free Breezers non mentholated drops. You know… for when you still enjoy your coffee when you shouldn’t be drinking it. 🙂 I did really like the Kiwi Apple flavour though! Dare I even wish that I had the sniffles JUST enough to need to enjoy this little slice of heaven? I think I’ll just encourage my boy to hog the TV this weekend. Works for me! Donna, well done again! 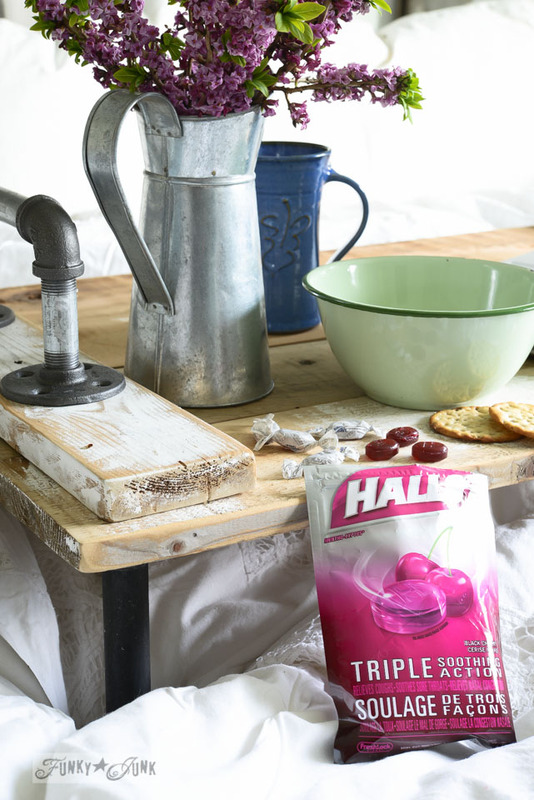 And your tray can easily be adapted anywhere outside the bedroom, too, due to its’ utilitarian, cool design. Another gem. Sweet! P.S. Other uses: dessert tray, dish caddy, centerpiece…. The list goes on! Thanks Ken, and so true, if you unscrew the legs, it makes a great everyday tray, perfect for a coffee table that requires coasters. I love this tray. And I am going to make one sometime soon also. Not my first priority, but so cute. And I have not had a cough drop in so many years. I used to love the Citrus Mixed style with Vitamin C though. The grapefruit is my favorite. Before those, it was always just lemon drops for my throat. Well, please don’t get sick just to use your cute, new tray. I think using it for morning coffee will work much better…. grin. LOVE, love, love this! 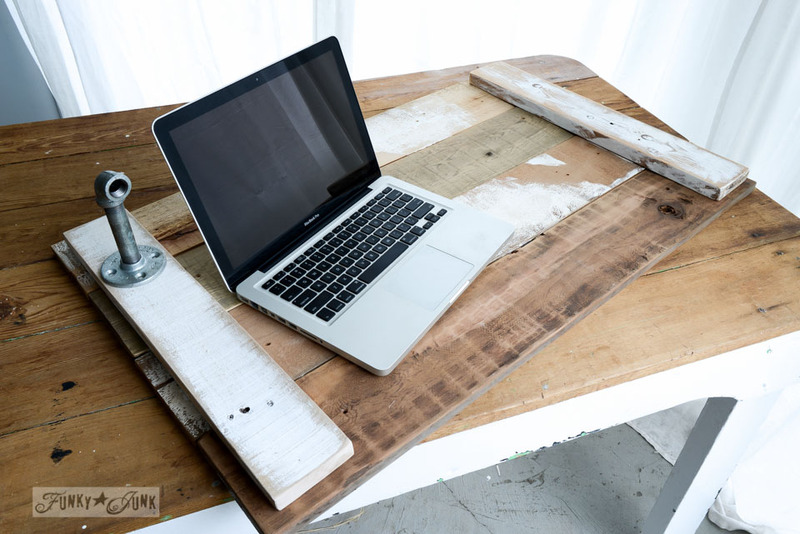 I think reclaimed wood and industrial pipe look perfect together – I might just have to make one of these for myself! This is awesome! Don’t you love the plumbing section? So many great ideas in those isles! Your photos are magazine worthy! Cheers. Aw, thanks Feral! The new camera has indeed been a good move it seems! 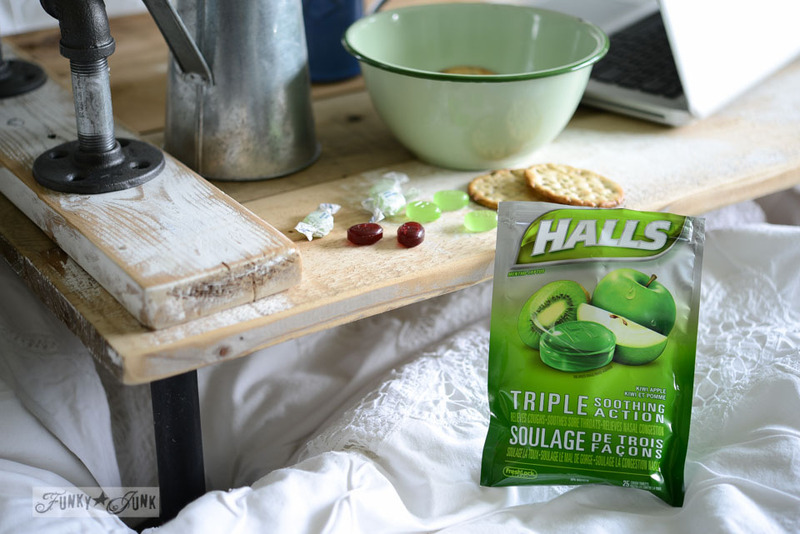 That looks great and love the lilacs, nice touch with those funky flavored halls. Who knew? Sometimes I feel like I live in the stone age. Love this tray and the hardware is excellent. As always LOVE it! love it, where did you buy the pipe fittings? I love it!! Last night I was looking at bed tray at Goodwill, but I just didn’t like it – when I find one I like, I don’t like the price tag!! This is fantastic, and I’m already in the middle of building several things, I should end up with enough leftover wood! A bathtub tray is already on my list, why didn’t I carry that thought over to this?? I’m very glad you did!! 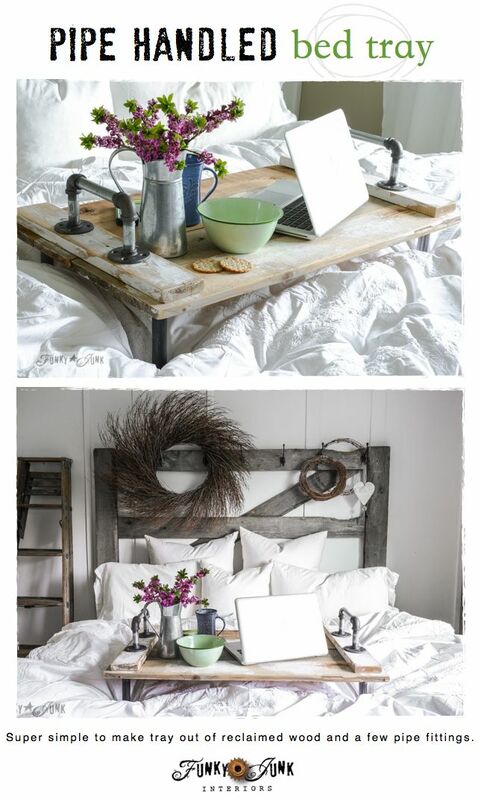 I love that bed tray! Wow, so creative and beautiful! I love that tray! The industrial look of all the pipes is just too cool. And I could snuggle in there for a nap today – for some reason I’m terribly sleepy this afternoon! This is so great! I desperately need something like this, working from home in whatever room my two year old wants to be in! Seeing how you are always putting pipes to use is helping me work up the nerve to try some. Any chance you could post a picture of the underside so we can take a look at how you assembled the legs? Hi Cassie, thanks! If you look at the 5th picture down, the pipes to the right are the legs. They were just screwed directly to the underside of the tray, just like the handles were. A picture of that would have been a good idea! I may do that at some point if the instructions are still a little vague. Thanks for your feedback! Thank you Donna! I see it now, I must have been too excited looking at your great pictures and wasn’t paying enough attention!! The tray is such a great design. GREAT JOB! Very cool! 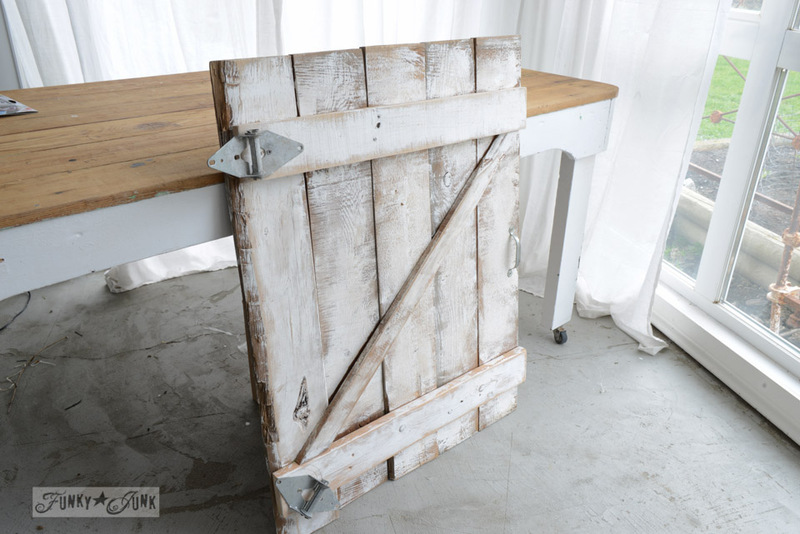 Love the industrial flair that it adds as well. Donna, does the pipe stain the white bedding? I love it, and have some pine baseboard that we just removed. This will be great! Used the pipe in my walk in closet already. Hi Sally! I made sure to use a degreaser on the pipes and it seems to be fine! I imagine you could even use a clear spray sealer on it too if desired. So far, so good here! Love this! 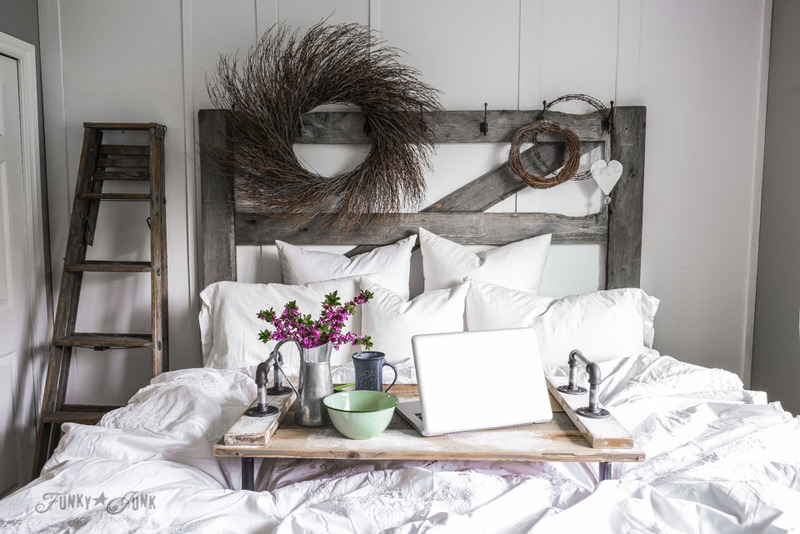 I have also always loved all white bedding, so fresh and inviting! Pinned it twice! It’s late, I’m tired but still want to get these old emails done…and seeing these pictures of your bed & new tray want me to say the heck with it and curl up in my own comfy bed with my cats & phone (or laptop…but I think I’ll need one of these before I bring my laptop to bed with me, even though I have one of those fan stands for it). I love all the hardware you used! Ugh… I hear ya. I just LOVED the pipe look so I spent what it took. I don’t think mine came to that high of a price… what about just using pipes for the parts you desire and wood for the rest to save $$? I need this in my life!!! Absolutely love it! This really didn’t inform me on hhow to make it. I don’t know if it’s justme but, I am a follower-to-the directions kind of girl, so it would’ve been nice to have a directions paragraph. Hi Elise! I just read through the post again and it appeared self explanatory to me. That said, I have since changed the format of my tutorials to be more step-based vs. story-like. So I dug in and edited this post so it better reflects an easy to follow tutorial. Thank-you for your feedback and the reminder that the new way is more legible! Let me know what you think!